There is often a sense of nostalgic when quoting Micah 6:8. This is deemed an important ideal to the human spirit, regardless of religious or political persuasion. But unpack this a bit. What are the implications for you and me? What are the expectations of the Lord for us? The setting is a discussion of what might be pleasing to God. Is it a set of actions that we construct? Will the Lord be pleased with sacrifice? Will He be sufficiently pleased with religious activity, such as going to church, serving others when it is convenient, or giving now and again, or even tithing? 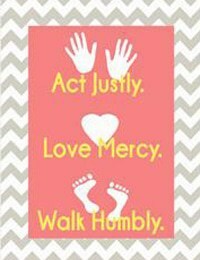 Notice that this is an action packed list of expectations—Act justly, love mercy and to walk humbly. These are all proactive words. These are to be major life initiatives, a focus to live out of our routine; out of our comfort zone. The Lord expects that we will stretch—to act, to show mercy all the while walking with in humility, that is, with no hint of self-importance. These are not occasional activities. They are required. Commend education; Offer knowledge (mentor); put humility before honor; be a listener; heed correction; dialogue with God, that is prayer. This pleases Him. These are some of these are ways to wear the mantle of acting justly, mercifully and walking humbly. Sign up today or review your profile and ministry matches to see ways the Lord and others can be served in such a way that the Lord requires. Nelson is the generic Evangelical baby-boomer. Born in 1946, raised in the C&MA and attended Urbana ’67 in college. He holds an MS degree in Chemical Engineering and worked in R&D positions in American industry for 33 years. Nelson is an inventor with formal training in methods of creative problem-solving. He was a founding elder at Walnut Hill Community Church in Bethel, CT (1982) and served in many leadership capacities of what is now one of the largest Evangelical churches in New England. In 1998 Nelson founded the Finishers Project, now MissionNext, and serves in program development. Locally he attends a Torah study and is chairman of the sewer commission to serve among unchurched leaders. Good words Nelson! Important to remember that the Lord wants to build our character and that trumps our works every time. Heart attitude is the foundation that makes us able to minister properly and bring glory to our Lord! I think it is a bit harder in today’s world, don’t you?